Sidney Street, Whitechapel. Photo © David Secombe 2010. Half a century ago, the East End remained a closed book to the rest of London; hence the alarm created by the Hounsditch murders and the ensuing gun battle of Sidney Street. Londoners realized the unpleasant fact that there were gunmen in their midst and a vast floating population of refugees and anarchists living somewhere or other only a short distance from the opulent City. Peter the Painter, that elusive, unsatisfactory figure, and his gun-toting frienfds have always fascinated me, and I have visited the scene of their operations time and time and again. Whenever I go, in spite of modern changes (though there is a great deal left unchanged), I seem to see the top-hatted figure of Winston Churchill peering round a doorway during the gun battle, and policemen with walrus moustaches stare of the past, along with loungers in greasy cloth caps. Sidney Street is more orderly today, and on the site of the siege the houses have been replaced by flats, but I remember the besieged house clearly … I also remember also a local coming out to watch me draw the house and telling me how he had watched the siege and the smoke coming out of the roof. Last year was the 100th anniversary of the Sidney Street Siege, and the full text of The Guardian‘s contemporary report may be read here. Peter the Painter, the legendary leader of the terrorists, was never found and uncertainty as to his real identity – indeed, doubts as to whether he ever actually existed – persist to this day. (In Julian Fellowes’s recent Titanic TV series, he had Peter the Painter on board the ill-fated liner, which prompted a few derisive guffaws round my neck of the woods.) 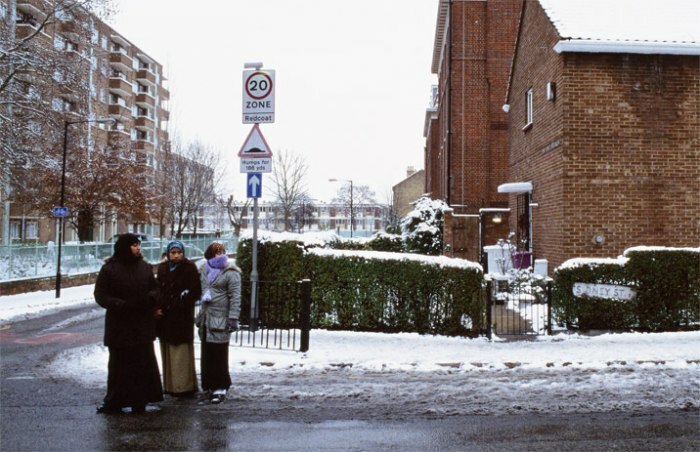 In 2006, Tower Hamlets Council named a social housing complex on the corner of Sidney Street and Commercial Road after the mysterious renegade, a decision which brought complaints from the Metropolitan Police and others. The above photo was taken a few yards from the spot where 100 Sidney Street stood. Fletcher’s account of the environs of Sidney Street was written fifty years after the siege, and The London Nobody Knows is all of fifty years away from us. Since Fletcher described the area with his antiquarian eye, the locale has developed newer sets of associations, newer urban mythologies. One strand of modern folklore which was brewing at the time of Fletcher’s early ’60s rambles eventually bore bloody fruit in a pub round the corner: a few steps from Sidney Street, on the Whitechapel Road, is The Blind Beggar, where Ronnie Kray shot George Cornell in 1966, and now a fixture on the unofficial London underworld coach tour. The Kray Twins were local, of course, and famously lauded as a positive force by a vocal assortment of cartoonish East End stereotypes. Local boys who made good and took care of their neighbours – a bit heavy handed sometimes, but they only fought their own. Violent but fair. That sort of thing. But that implausible golden era of neighbourly, family-loving criminals is as distant from us now as the Sidney Street Siege was to them, so it is no wonder that the 1960s East End seems impossibly exotic today. Back in the early ’90s, I spent an afternoon sightseeing in the East End with a former Kray associate, and we had lunch in Bloom’s, the famous kosher restaurant in Whitechapel High Street. As we entered the rather grand premises, my companion wistfully observed that ‘a few of the lads considered knocking this place over, back in the sixties. Lot of money used to come through here, all those nobs heading east for a bit of a thrill.’ Bloom’s finally closed in 1996, its heyday long past. In the last three decades, Whitechapel has become predominantly Bangladeshi in its ethnic make-up, and the East London Mosque, opposite the Blind Beggar, is a kind of 20th century counterpart to Hawksmoor’s great Christ Church, Spitalfields. And, with a certain historical inevitability, present-day suspicions of the ‘immigrant’ community crystallise around their perceived terrorist potential – so in that respect, the East End of 2012 is remarkably similar to that of 1911.